comScore released data from the comScore Video Metrix service showing that 188.5 million Americans watched 46.7 billion online content videos in August, while the number of video ad views totaled 22.8 billion. 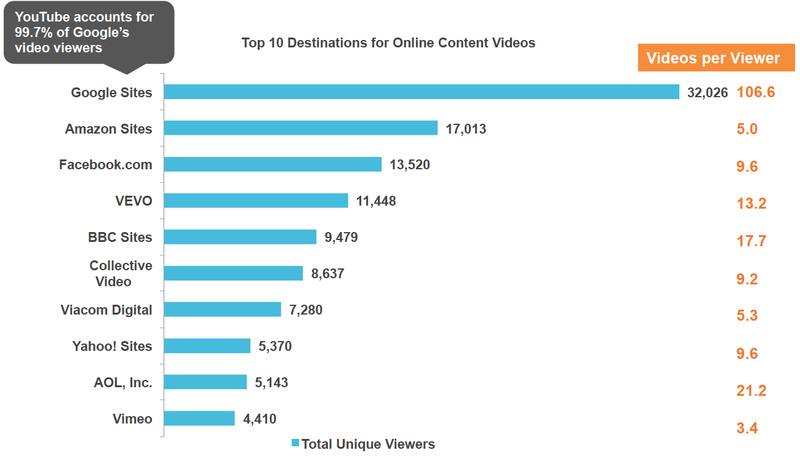 Google Sites, driven primarily by video viewing at YouTube.com, ranked as the top online video content property in August with 167 million unique viewers. AOL captured the #2 spot with 71.2 million, followed by Facebook with 62.2 million, NDN with 50.7 million and VEVO with 49.4 million. 46.7 billion video content views occurred during the month, with Google Sites generating the highest number at 17.4 billion, followed by AOL, Inc. with 992 million and Facebook with 803 million. Google Sites had the highest average engagement among the top ten properties. Americans viewed nearly 22.8 billion video ads in August, with Google Sites ranking #1 with 3.2 billion ad impressions. Adap.tv came in second with more than 2.4 billion ads, followed by BrightRoll Platform with 2.4 billion and LiveRail.com with 2.2 billion. Time spent watching video ads totaled 8.5 billion minutes, with BrightRoll Platform and Adap.tv delivering the highest duration of video ads at 1.1 billion minutes each. Video ads reached 56 percent of the total U.S. population an average of 132 times during the month. Hulu delivered the highest frequency of video ads to its viewers with an average of 71. 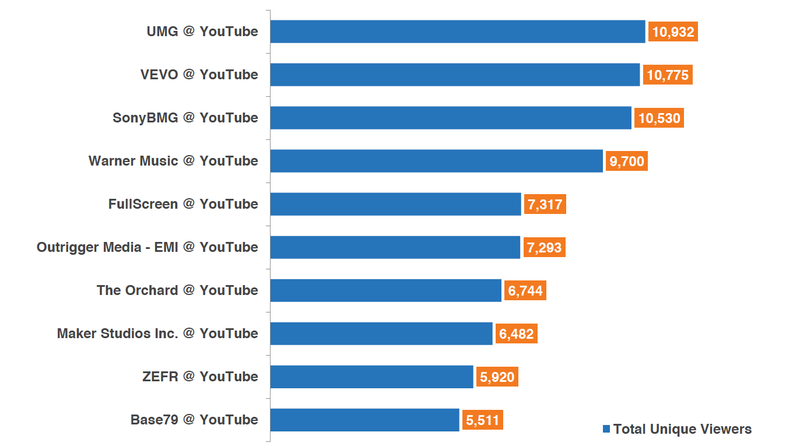 The August 2013 YouTube partner data revealed that video music channel VEVO maintained the top position in the ranking with 47.8 million viewers. Fullscreen held on to the #2 position with 34.5 million viewers, followed by Maker Studios Inc. with 29.6 million, Warner Music with 26.9 million and ZEFR (formerly MovieClips) with 24.9 million. Among the top 10 YouTube partners, Machinima demonstrated the highest engagement (91 minutes per viewer), followed by Maker Studios Inc. (65 minutes per viewer). VEVO streamed the greatest number of videos (580 million), followed by Maker Studios Inc. (521 million). 87 percent of the U.S. Internet audience viewed online video. The duration of the average online content video was 5.2 minutes, while the average online video ad was 0.4 minutes. Video ads accounted for 32.7 percent of all videos viewed and 3.4 percent of all minutes spent viewing video online. Britons surfing the web via PC remained strong at 44.6m unique users, with video consumption growing slightly month on month. On-network mobile browsing was the story in April with an overall month on month increase of almost 3% to 28m, with daily visitors increasing 10% to almost 11m. UMG swapped places with VEVO to become the top UK YouTube partner channel, whilst IODA dropped out of the top 10 ranking, being replaced by The Orchard. Interest in family matters was demonstrated with Education-Information being the second most visited category, with About.com Education, TES.co.uk and UCAS.com all ranking highly within that sector. Just-Eat achieved a top five position, further demonstrating the increasing usage of mobile in all aspects of consumers’ lives and the growing value of convenience when it comes to food. 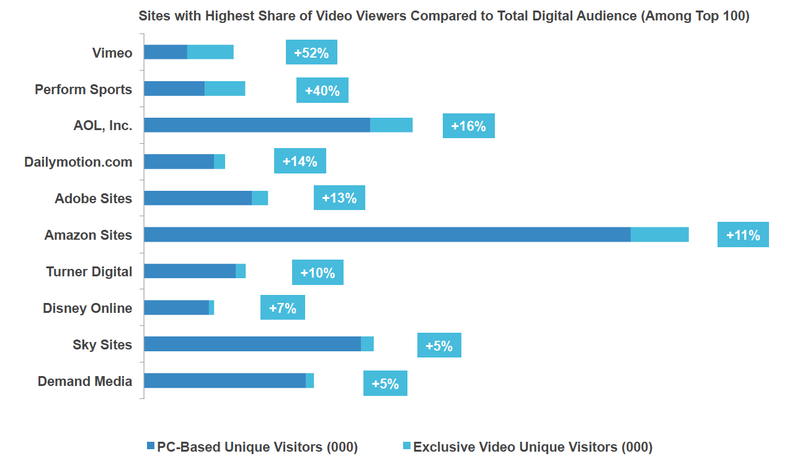 comScore, released data from the comScore Video Metrix service showing that 182 million Americans watched nearly 41 billion online content videos in May, while the number of video ad views reached 15.8 billion. April was essentially the same as March when it comes to the overall numbers. Ads continued to rise, as we saw more than 13.2 billion ads last month, a new record that displaces the one just set the previous month. The overall viewing and engagement scores stayed virtually the same, with some sites seeing slightly less action and some sites seeing slightly more. Anyway, these ads are blowing up, and this is something we should see increase every month this year if all the reports are to be believed when it comes to ad buying. Last month, Viacom was 5th, NDN was 6th, and Yahoo! was 4th. They all have pretty much the same amount of unique viewers, but it looks like NDN (News Distribution Network) has a decided edge on the total minutes for viewer. In fact, it’s 2nd among all of these sites. It has been 2nd for awhile, but something worth pointing out. Nothing new hit the top 10 for unique viewers. The aforementioned NDN also makes an appearance in the top 10 of the viewed ads chart. The total amount of ads increased by about 70,000, we saw about 100 more minutes of ads, and they now reach 52.6 percent of the audience. These stats continue an incredible uptick from earlier in the year. The top 5 saw no change. Machinima continues to work their way down this list after being in the top 5 forever, but they are still far and away the kings of total overall engagement, as their videos are watched for more than an hour by each viewer. No other network has that kind of stat. The closest is Maker at nearly 50 minutes. Still, whether it’s a new way of assessing data at comScore, or some other reason, Machinima used to command about an hour and a half per viewer. Coming out of nowhere this month is The Orchard. They were 9th in January, 10th in February, MIA in March, and they earned 6th in April with over 23 million unique viewers. I’m sure we’re going to keep seeing the ad explosion over the course of the year. That will be the biggest story coming out of these rankings in 2013.
comScore, Inc. released data from the comScore Video Metrix service showing that 178 million Americans watched 33 billion online content videos in February, while the number of video ad views reached 9.9 billion with Google Sites delivering an all-time high of 2.2 billion. Google Sites, driven primarily by video viewing at YouTube.com, ranked as the top online video content property in February with 150.7 million unique viewers, followed by Facebook with 61.2 million, VEVO with 49.5 million, NDN with 46.3 million and Yahoo! Sites with 43.6 million. More than 33 billion video content views occurred during the month, with Google Sites generating the highest number at 11.3 billion and Facebook reaching its all-time high of 558 million. Google Sites had the highest average engagement among the top ten properties. Americans viewed 9.9 billion video ads in February, with Google Sites ranking first with its all-time high of 2.2 billion ads. BrightRoll Video Network came in second with 1.6 billion, followed by Hulu with 1.4 billion, Adap.tv with 1.4 billion and LiveRail.com with 1 billion. Time spent watching video ads totaled 3.8 billion minutes, with BrightRoll Video Network delivering the highest duration of video ads at 859 million minutes. Video ads reached more than 50 percent of the total U.S. population an average of 63 times during the month. Hulu delivered the highest frequency of video ads to its viewers with an average of 61, while CBS Interactive and Google Sites tied for second with an average of 23 ads per viewer. The February 2013 YouTube partner data revealed that video music channel VEVO maintained the top position in the ranking with 48.2 million viewers. Fullscreen held on to the #2 position with 36.8 million viewers, followed by Maker Studios Inc. with 30.5 million, Warner Music with 26 million and ZEFR (formerly MovieClips) with 23.8 million. Among the top 10 YouTube partners, Machinima demonstrated the highest engagement (61 minutes per viewer), followed by Maker Studios Inc. (42 minutes per viewer). VEVO streamed the greatest number of videos (514 million), followed by Machinima (374 million). *YouTube Partner Reporting, beginning last month with January 2013 data, gives credit to YouTube Partners for views of their single-claimed user-generated content. 83.3 percent of the U.S. Internet audience viewed online video. Video ads accounted for 23 percent of all videos viewed and 2 percent of all minutes spent viewing video online. comScore released the 2013 Digital Future in Focus report. This annual report examines how the prevailing trends in social media, search, online video, digital advertising, mobile and e-commerce are defining the current digital marketplace and what these trends mean for the year ahead. Americans’ usage of Social Networking sites continued to be dominated by Facebook, which accounted for 5 out of every 6 minutes spent online on these sites. Facebook’s 2012 IPO signaled a maturation of the social media market with a renewed focus on building strong business models and monetization streams. Several other social media players also made waves in the public markets this year, including LinkedIn, Yelp, Zynga and Groupon. Several other notable social media players like Twitter, Tumblr, Pinterest and Instagram (now part of Facebook) have all posted strong user growth as they begin to ramp up their revenue engines. Google continued its strong lead in the U.S. search market, while Bing managed to gain ground as the #2 search engine in 2012. The desktop-based U.S. core search market saw its first signs of flattening as an increasing number of searches shift to vertical-specific searches and mobile platforms. The U.S. online video market also shows signs of maturing from a consumption standpoint, but monetization is picking up steam as YouTube ramps up advertising efforts while traditional media players find success with TV commercial content. Because the demand for high-impact video advertising exceeds the available inventory, look for continued momentum on the advertising side – particularly as targeting improves. Nearly 6 trillion display ad impressions were delivered across the web in 2012 as brand marketers have become increasingly comfortable with a medium capable of delivering strong marketing ROI. Despite delivering so many impressions, comScore research showed that an average of 3 in 10 ads are never rendered in-view, leading to significant waste, weaker campaign performance and a glut of poor-performing inventory that imbalances the supply-and-demand equation and depresses CPMs. Through the continued adoption of a viewable impressions standard, the market is beginning to embrace a digital scarcity model that better aligns monetization with the value created by the inventory. 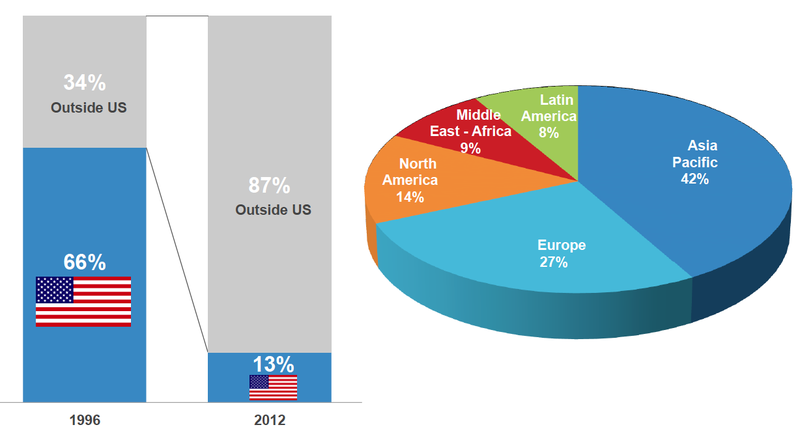 Smartphones continued to drive the mobile landscape in 2012, finally reaching 50-percent market penetration in 2012. The Android platform also hit a 50-percent milestone as it captured the majority of the smartphone market for the first time. Meanwhile, tablets continued to gain traction, with 52.4 million U.S. tablet owners as of December 2012. The rapid adoption of smartphones and tablets, and consumers’ increasing use thereof, has resulted in a fragmented digital media landscape where the typical consumer now shares his time across multiple screens. Despite the backdrop of continued economic uncertainty, 2012 was a strong year for retail e-commerce. Throughout the year, growth rates versus the prior year remained in the mid-teens to outpace growth at brick-and-mortar retail by a factor of approximately 4x. Total U.S. retail and travel-related e-commerce reached $289 billion in 2012, up 13 percent from the previous year. While e-commerce continues to gain share from traditional retail, the first signs of mobile commerce affecting the digital commerce landscape are starting to emerge. In Q4 2012, comScore estimates that m-commerce transactions (from both smartphones and tablets) now represent approximately 11 percent of corresponding e-commerce spending.